Rory McIlroy lost out on an early 2017 victory Sunday. But it’ll be much bigger if he can score a win Monday. A dramatic final round at the BMW SA Open ended with Graeme Storm defeating McIlroy on the third playoff hole. It’s Storm’s second European Tour win and an inspiring one. But McIlroy has more than a loss to a journeyman to worry about. The Northern Irishman revealed Friday that he injured his back before the second round and thought about pulling out of the event at that point. He stayed with it through the end, but the pain didn’t subside. McIlroy somehow pulled off a third-round 67 despite struggling to sleep and feeling discomfort for the first part of the round before anti-inflammatories helped him feel better. After what he’s felt this week, though, McIlroy isn’t taking any chances. The 27-year-old said after the final round that he’s taking a precautionary doctor’s visit Monday to get the back issue checked on further. “The back is kind of ok. I am going for a scan tomorrow,” McIlroy said. “I fly to Dubai (for the Abu Dhabi HSBC Championship) tonight and then will go for an MRI tomorrow just to see what’s up with this joint in my back. As McIlroy indicates here, he doesn’t seem overly concerned. That doesn’t mean it’s something to avoid tracking. And he did note that his playing in Abu Dhabi isn’t 100 percent. McIlroy prefers to prioritize the long view, and if that means skipping a week, so be it. © Warren Little/Getty Images/Getty Images Rory McIlroy of Northern Ireland reacts as he leaves the 18th green during the final round of the BMW South African Open Championship on Sunday. Rory McIlroy is dealing with an injury after just one tournament in his new season. McIlroy, proclaimed as a favorite to win at least one major this year and dominate again, suffered a back injury in his 2017 debut in South Africa. We heard a mention of the trouble after Friday’s second round and now on Sunday after the conclusion of the BMW SA Open, which he lost in a playoff, McIlroy has stated that he’ll be having an MRI on the back before this week’s scheduled Abu Dhabi start. McIlroy called the MRI “precautionary” on Sunday, telling the assembled press the purpose is “see what’s up with this joint in my back.” The cause for the sudden trouble is unknown and not pinpointed to one specific swing or move this week. Rory speculated that it may have been muscle fatigue from an offseason in which he thoroughly tested different equipment to prepare himself for his first season since Nike left the hard goods golf business. The back pain was more than some minor trouble on Friday, as Rory said he contemplated withdrawing from the tournament before the round. He still went out and shot a 68 that included an eight-hole stretch that he played in 8-under. He almost won the entire damn tournament, losing in that playoff to Graeme Storm on Sunday. This is obviously not the high point of the season and missing some time in January or February is much easier to swallow than, say, ripping up your ankle in the middle of the summer and not being able to defend your British Open title. So resting the back to ensure you’re in perfect condition by late March or early April would certainly be forgivable if that’s the route that Rory is advised to take. Rory said he managed this week with “tape and a few pills,” but this upcoming swing through the Middle East, starting this week in Abu Dhabi, could require a different approach. Rory has held this season-opening stretch in the Middle East in high regard. The stop in Dubai was where he won his first event and has always been important to him. In fact, he had established a specific season-opening routine that begins with practice time in the Middle East before his debut at those Euro Tour events. Opening in South Africa this year was a deviation from that regimen and done as a favor to SA Open host and friend, Ernie Els. For a player who stands at the top of a year overflowing with hype and anticipation, here’s hoping Monday’s MRI reveals nothing serious. 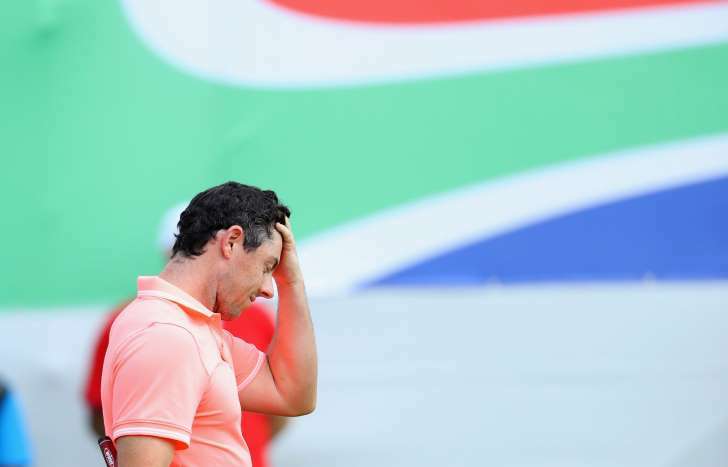 Rory McIlroy lost the South African Open in three playoff holes to Graeme Storm on Sunday after a bogey at the 18th. He went all the way to extra holes despite tweaking his back earlier in the week, an incident that has some folks concerned about his 2017 season. McIlroy hurt himself on Friday and almost withdrew before shooting a 68. He is slated to play the Abu Dhabi Championship this week with Dustin Johnson and Rickie Fowler, but that could be in doubt now as McIlroy noted that he will get a MRI on Monday. "I am going for a scan tomorrow," he told the European Tour. "I fly to Dubai tonight and then will go for an MRI tomorrow just to see what's up with this joint in my back. It was manageable this week with tape and a few pills, so I am fine, but first and foremost I have to get fully fit and healthy again and hopefully I'll be all right to play next week. "We will see what happens, but like I said, it is manageable with the tape and a few anti-inflammatories, but it's not 100 percent. Part of me really wants to make this week because there is so much to play for, but at the same time, there is so much to play for over the whole season and I don't want to jeopardize long-term goals for short-term gain. Hopefully, I'll be good to go." McIlroy has not missed significant time since the 2015 Open Championship, which he missed with a ruptured ligament in his ankle. If he misses Abu Dhabi, it seems like it will be precautionary more than anything else. This is a big year for him when it comes to the major championships, and with the Masters less than 100 days away, there is no reason to risk an injury on Abu Dhabi. "If it's a muscular thing then it's just fatigue," McIlroy said earlier this week. "I have hit a lot of golf balls over the last four or five weeks, testing equipment, so I think that's probably just the thing. I have been hitting a lot of drivers, and you put a lot of force on your body when you do that." McIlroy's club testing led him to put the Callaway Epic driver and a set of Callaway irons in his bag in South Africa. Hopefully, we will get to see him and them again this week. 0 Response to "Rory McIlroy to undergo precautionary MRI on back Monday"